There is more to Money Monster than meets the eye. Yes it deals with the familiar in the guise of a television show hosted by one Lee Gates (George Clooney) with hot dancing chicks accompanying supposedly hot stock tips. The first clue that something is amiss takes place in the initial disquisition in which Lee is setting up the day’s program in league with his producer Patty Fenn (Julia Roberts). The banter is interminable and you wonder if the show is ever going to go on the air. But that’s actually the point and it’s underscored by Jodie Foster’s brilliant surrealist direction. Gates, Fenn and the others on the set are caught in a kind of time warp. It's a little like Bunuel's Exterminating Angel, where the movie's characters are trapped in room or one of those episodes of Twilight Zone where people become prisoners of fictitious worlds. The claustrophobia is also a metaphor for the self-imploding financial world that the movie itself portrays where algorithms generate high speed trades. It’s a world that has very little to do with productivity and value and lots to do with a mixture of technologic overdrive and show biz. The human price of this kind of distorted value free universe is what the title of the film alludes to and these initial scenes in which one day’s fateful segment is being readied for broadcast are a wonderful and ominous presaging of what’s to come. The character at the center of the drama is Kyle Budwell (Jack O’Connell) who owes his provenance to Travis Bickle and host of other alienated figures who, as outliers and victims of forces over which they have little control, defend themselves with the creation of obsessional universes. Still, Budwell’s sparks of truth pepper the sky, like shooting stars in the great beyond. Kyle’s fate is as much a product of cinema history as it is of television news or the disreputable nature of the financial world (the final scene recalls Jean-Luc Godard’s Breathless). 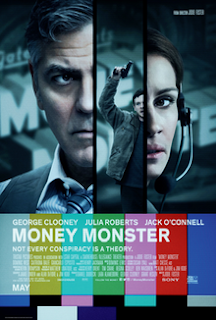 Money Monster capitalizes on a certain suspense, but it's more like a soap opera than a cliffhanger and remarkably stolid and almost impassive in its depiction of its own version of flesh eating bacteria.